Hello and Happy Tuesday... but it feels like Monday! I really enjoyed being off Labor Day but it sure puts a damper on Tuesday! 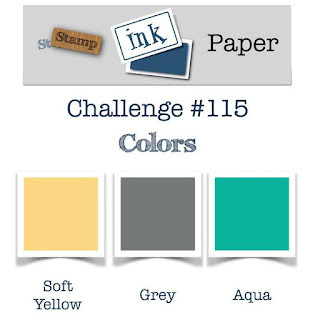 So of course Tuesday means another Stamp, Ink, Paper Challenge and this is probably my favorite Color Challenge that we've had... Aqua, Gray and Light Yellow! 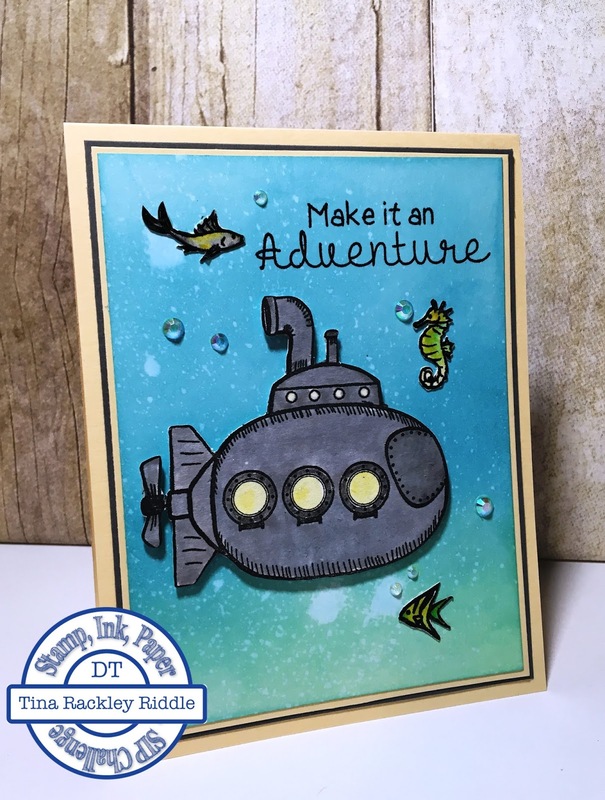 I immediately thought of an ocean scene and that brought me to this super cute stamp set from Fun Stampers Journey called An Adventure! It's an adorable ATS (Artist Trading Stamp) that is only $8.95.. What a deal!!! This is my first time to use it and I really am loving it! So for this one I started with a 3 3/4" x 5" piece of Bristol Smooth Cardstock. I used a ink blending tool and Tim Holtz Distress Oxide Inks in Broken China and Cracked Pistachio for the Ink Blended Background. This is the first time I had used the Distress Oxides and they are awesome! Seriously they blend so smooth on the Bristol Smooth Cardstock. I started with Cracked Pistachio on the bottom and Broken China on the top and then blended it down into the Pistachio. After I had it all blended I spritzed it with my Distress Water Mister and then laid a paper towel over it to absorb the ink. It made such a lovely ocean background! Next I stamped the Submarine from the An Adventure Stamp Set onto some Watercolor Paper.. this was a mistake. Although it all turned out well, I should have used Bristol Smooth for the Submarine. My Brother Scan-n-Cut cut out the Submarine for me since I had not purchased the coordinating die for the stamp set. I used Zig Clean Color Markers to color it in and this is where I noticed that watercolor paper does not blend like Bristol Smooth. It took several layers of color and Clear Wink of Stella to make it look right. I really should have just stamped it again on Bristol but I was determined to make it work. I'm seriously hard-headed like that! lol Once I decided where I wanted my Submarine I used my Misti to stamp the sentiment in just the right spot. I love the Misti because I can continue to stamp in the exact same place several times. I stamped the sentiment with FSJ Black Licorice Ink and then clear embossed it. Ok, so you know that I can't make a card with just one stamp set.. right?? So I wanted to add some fish so I stamped the Fish and Seahorse from a Hero Arts May 2017 My Monthly Hero Set. They were just the right size to go with my Submarine! I stamped them in Versafine Black Onyx Ink onto a scrap of Bristol Smooth Cardstock (lesson learned!) and then clear embossed them. I used Zig Clean Color Markers and an Aqua Painter to color then. I used the coordinating dies to cut them out but then decided there was too much white showing so I fussy cut right up to the black line on them. I attached them to my background with Ranger Multi Medium in Matt Finish. My Submarine was then attached with Foam Tape....... and a LOT of it! I matted this in my very favorite Yellow Cardstock.... FSJ Banana Cream. I LOVE this color!! I then matted that with FSJ River Stone Cardstock and then mounted the entire panel on an 11" x 4 1/4" piece of Banana Cream scored at 5 1/2" for a top folding card base. Last but certainly not least I added some Lucy's Cards Rainbow Sparkle Mix Jewels with Ranger Multi Medium Matt! I adore all things Nautical but I think this is one of my favorites of all of the ones I've made! I can't wait to make more Under the Sea backgrounds... I'm heading to do that now! If you haven't given it a try.. go do it! It's a blast! Your background looks so good, Tina. Great card!